Ahead of his visit to New Delhi and Mumbai next week, his second since he entered No 10, the prime minister told Indian media there were already 40,000 Indian students in the UK and he hoped numbers would increase in the future. He made clear that the only requirements for students wishing to come to the UK were a guaranteed place at a university and a basic English qualification. 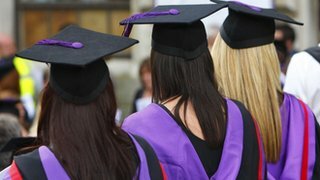 Changes introduced last year mean foreign students will only be able to remain in the UK after graduating if they get a graduate-level job with a salary of at least £20,000 from an accredited employer. Critics have said this has contributed to a fall in the number of Indians and other foreign students applying. Visiting India himself in November, Mayor of London Boris Johnson urged the government to reconsider, suggesting the policy sent the "wrong signal" and could damage the UK's reputation as one of most open and dynamic higher education markets in the world. Asked by Sunrise TV whether the visa rules would provide a "hindrance" to economic ties between the two countries, Mr Cameron said he thought "we have not perhaps communicated this properly". But he added: "The fact is today, as we stand, and this is going to be the case going forward - there is no limit on the number of students who can come from India to study at British universities, no limit at all. "And what's more, after you have left a British university, if you can get a graduate-level job there is no limit to the amount of people who can stay and work or the time that they can stay at work." The UK, like all countries, had a duty to control immigration, but he said it had a "great offer" to make to Indian students. "Now we need to take that message out to talented young people in India and say if you want to make that choice, Britain will be incredibly welcoming." The Home Office has been seeking to tighten up routes of entry into the UK and break the link between temporary migration and permanent settlement as part of efforts to substantially reduce levels of net migration. Home Secretary Theresa May told the Conservative Party conference last autumn that the UK wanted to attract the brightest and the best but the higher education sector could not be treated differently because of its value to the British economy. There are about 300,000 students from outside the European Union enrolled at courses at UK institutions and numbers rose 6% in 2010-11 - the last year for which official figures are available.